Vitamin E is a term that encompasses compounds known as alpha, beta, gamma and delta tocopherols as well as alpha, beta, gamma and deltatocotrienols. These fat soluble compounds are used by the body to ensure that all the muscles function normally. They are also used to make red blood cells. As a powerful antioxidant, vitamin E prevents the cell damage caused by free radical from cigarette smoke, radiation from the sun and air pollution that contributes to premature aging and degenerative diseases. The body also needs this nutrient to maintain a healthy immune system. 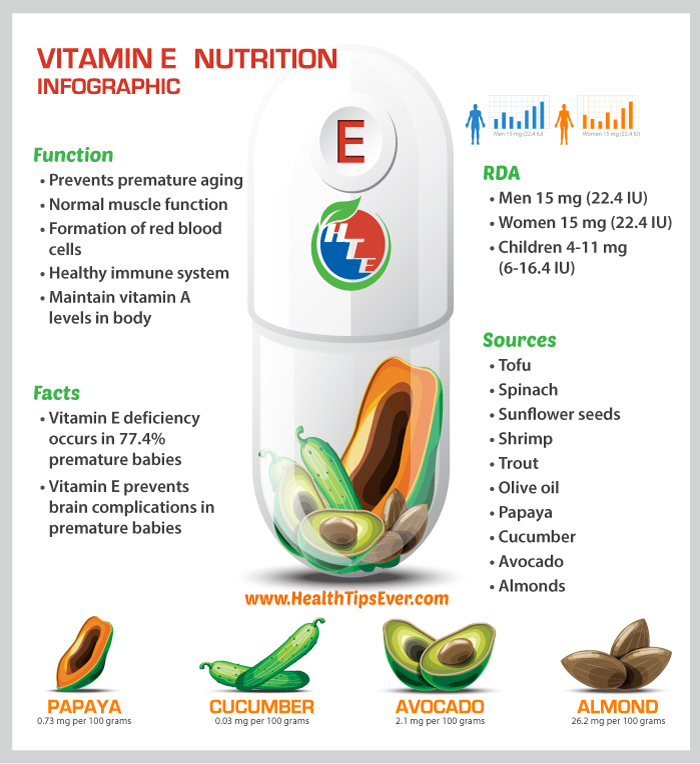 Vitamin E is also used by the body to maintain adequate stores of nutrients like vitamins A, K, iron and selenium.The body also requires it to utilize vitamin K which is vital for the blood clotting process. Other good sources of this vitamin include broccoli, squash, pumpkin and sweet potatoes. Herbs and spices like oregano and paprika are also good sources of this nutrient. Nut butters like peanut butter are other rich sources of vitamin E. Kiwifruit and mangoes are some of the fruits that contain vitamin E, albeit in modest amounts. Foods that have been fortified with vitamin E are other great sources of this nutrient. Examples include milk, breakfast cereals, fruit juices and margarine. The recommended dietary allowance (RDA) for vitamin E is 15 mg (22.4 IU) for both men and women. This RDA can be provided by 1 tablespoon of wheat germ oil or 3 ounces of dry, roasted sun flower seeds. 5 cups of boiled spinach also provide the total recommended amount of vitamin E.
Vitamin E deficiency is not common in healthy adults but it occurs in 77.4% premature infants in the United States. Symptoms of vitamin E deficiency include chronic diarrhea and greasy stool. Adults with fat-malabsorption disorders can also develop deficiency of this fat soluble vitamin. Symptoms of its deficiency in adults include eye problems, nerve problems like peripheral neuropathy and an abnormal gait. Vitamin E is required by the body to ensure that muscles work normally and prevent the free radical damage that causes degenerative diseases and premature aging. Foods that are good sources of this vital vitamin should therefore be consumed every day.